Ka-ching! The cost of Internet shopping may soon be going up for North Carolinians if e-retailers jump aboard an Internet sales tax amnesty program announced on Friday by the state's Department of Revenues. The plan would allow online retailers to avoid paying past sales taxes, interest and penalties on any sales made before September, provided they agree to start collecting the taxes in the future. North Carolina is just the latest state in the nation to take aim at what it views as a missed opportunity to collect potentially hundreds of millions of dollars in unpaid state sales taxes. The change would also simultaneously bolster the competitiveness of its local brick-and-mortar merchants by leveling the playing field against their interloper Internet rivals. North Carolina e-shoppers, however, could potentially be looking at an additional 7.75% in costs for some items purchased over the Internet. A $1,575 platinum and diamond ring engagement setting, for example, could set a buyer back an additional $122 when tacking on the sales tax. Consumers may be feeling poorer, while state and local merchants benefit. Under the state's Internet Transactions Resolution amnesty program, only e-merchants that used a North Carolina affiliate to help drive a sale will be eligible for the program. These e-retailers have until June 30 to sign up for the program and, should their application be accepted, could forgo paying taxes, penalties or interest owed prior to Sept. 1. The e-merchants, of course, would be required to register for a sales and use tax, collect the taxes and shoot them over to the state. North Carolina is hoping to generate an estimated $161.8 million in lost sales tax revenue from a pool of 350 potential online merchants, said Beth Stevenson, a spokeswoman for the North Carolina Department of Revenues. 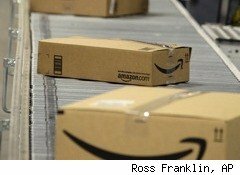 Amazon (AMZN), for one, filed a lawsuit to block North Carolina's attempt to gain access to its treasure-trove of customer data. That would include names and addresses of those state residents who made purchases on its site in an effort to assess the amount of back sales tax it believed was owed. Stevenson declined to say whether Amazon, or any other e-merchant, expressed interest in joining the program. "While eBay is not a retailer, hundreds of thousands of small business retailers use our marketplace to connect with consumers across America and around the world," Brian Bieron, senior director of federal affairs at eBay, said in a statement. "The federal law on sales taxes is quite clear, retailers with a presence in a state, such as North Carolina, can have sales tax collection and remittance duties, and that's appropriate given the benefits that come along with being located near consumers." But Bieron noted that imposing new tax burdens on small business retailers, especially in this economic climate, is detrimental to job growth and a favorable small business climate. Amazon and several other online merchants didn't comment as to whether they would participate in the program or whether they had seen a drop off in business in those states that also impose an "Amazon tax." "We haven't heard it's making a major impact on sales," said Craig Shearman, vice president of government affairs for the National Retail Federation. "We hear consumers favor the Internet for its convenience, not so much because it's a way to avoid sales tax." North Carolina, which last fall passed legislation to tighten a loop hole in its sales tax laws, put into a place an "Amazon tax" law similar to one operated in New York since 2008 and Rhode Island. The law affects sales in those states if an affiliate is used to make the sale and that affiliate resides in the state. Amazon created a ruckus when it severed affiliate ties to avoid the sales tax law. Colorado, meanwhile, has a different law in place that requires the online retailer to advise buyers of their obligation to report and pay their sales tax on purchases. California and Hawaii passed similar "Amazon tax" bills, but ultimately they were vetoed, Shearman said. And Connecticut, Minnesota, Maryland and Tennessee all currently have legislation that has been introduced but has not yet passed. These laws consider the affiliate connection as good as saying an Internet retailer has a virtual brick-and-mortar presence in a state, which therefore makes then subject to sales tax. "We say no they are not. There is only the slightest relationship with the retailer," Shearman said. Tell that to the nine states that have either passed or are considering similar laws.